Praise for the First Edition of MASTER SCHEDULING. "John Proud helps the reader to understand the application ofmaster scheduling principles and describes what works in greatdetail. 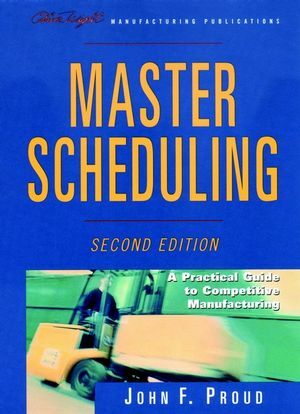 Master Scheduling will become the text for any course onmaster scheduling and the standard resource for all manufacturingcompanies. . . ." Richard C. Ling, President Richard C. Ling,Inc. In today s competitive, fast-paced world of manufacturing, everyaspect of a company s operation must be highly responsive to acustomer s needs. Master scheduling, when used in conjunction withEnterprise Resource Planning, is an essential planning tool thathelps manufacturing companies synchronize their production withactual market demand. In this expanded and updated Second Edition of the definitive bookon the subject, John F. Proud shows companies how to create andmaintain valid and realistic master schedules. Anyone involved indesigning and maintaining a company s master schedule will find awealth of practical, proven advice in Master Scheduling. From salesand marketing to manufacturing, materials management, andengineering, Proud includes important advice for integrating allareas of a company within the framework of an effective masterschedule. In every chapter of this edition, Proud introduces important newmaterial to ensure complete and up-to-date coverage of thisconstantly evolving field. Two entirely new chapters covering theprocess industry and manufacturing at multiple sites domesticallyand internationally have been added. The new chapter covering the process industry identifies where themaster scheduling mechanics and management issues are similar tointermittent manufacturing, as well as different. The supplymanagement chapter deals with managing an enterprise s internalsupply chain. Numerous short case studies are also included toillustrate important topics. Packed with helpful checklists, examples, and illustrations, MasterScheduling delivers easy-to-follow guidelines for implementing andmanaging a world- class master schedule. Proud shows managers howto avoid the most common problems while consistently maximizing theaccuracy and performance of the master schedule. JOHN F. PROUD is an educator, consultant, and Principal of Oliver Wight Americas. With more than a quarter century s experience in manufacturing support, Proud has helped dozens of companies improve their manufacturing operations through the use of ERP and master scheduling. He speaks frequently for organizations such as the American Production and Inventory Control Society and is actively involved in furthering the education of manufacturing professionals in the Americas, Asia, and Europe. The Mechanics of Master Scheduling. Managing with the Master Schedule. Using the MPS Output in a Make-to-Stock Environment. Scheduling in a Flow Environment. Two-Level MPS and Other Advanced Techniques. Using MPS Output in a Make-to-Order Environment. Master Scheduling in Custom-Product Environments.